Of the living; but the dead returning lightly dance. 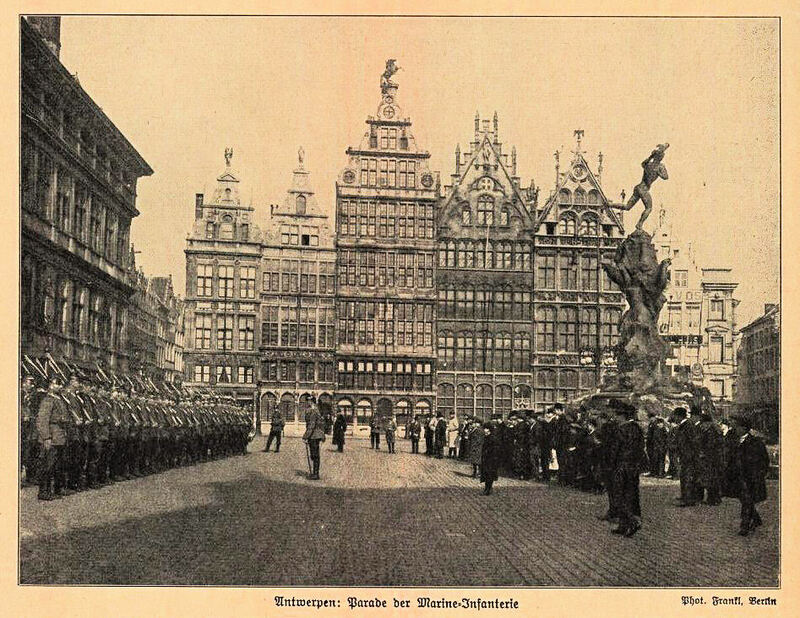 Imagine New Year's Eve in beautiful Antwerp, Belgium, 100 years ago. Do you suppose there was a single citizen who imagined that before the year's end his city would be bombed, besieged, and occupied for four years by enemy forces? How did we get to the situation in the Middle East today, and who is responsible? Scott Anderson sets out the scene and the characters as a journalist rather than an academic historian. While the title would lead the reader to believe that this is another tome concentrating on Lawrence, it is really an exposition of the fascinating characters who interacted in order to achieve the unending controversial outcome. 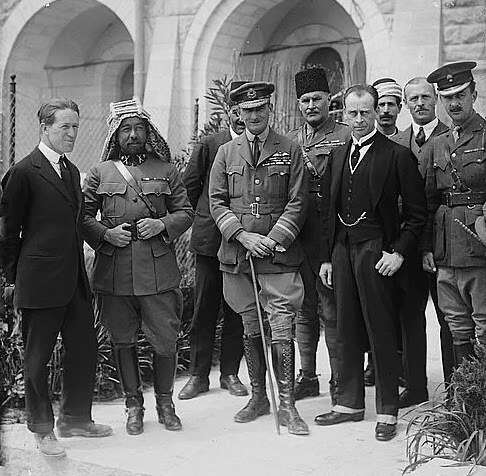 Lawrence, the famous one, interacts more or less with an American oil man (William Yale), a German intellectual (Curt Prüfer), a Jewish agronomist (Aaron Aaronsohn), an Arab monarch (Sharif Hussein ibn Ali), a French military officer (Colonel Édouard Brémond), and a British hierarchy that he informs, motivates, and betrays. This is a fascinating description of a theater of the war that has been comparatively ignored by military historians. Compared to the depressing aura of events on the Western Front, the warfare in the Ottoman Empire was so much more active. The author believes that because this was so far away from the centers of command and regarded of so little significance, the actors involved were able to innovate and improvise. Instead of trenches and futile assaults there are horse and camel charges, guerrilla ambushes, bandits turned soldiers, scientist turned spymaster, a family of revolutionaries, a decomposing empire, and ultimately oil. While most of this history could be said to revolve around Lawrence, an archaeologist with no military training but with a scholarly background focusing on medieval history and the Crusades, the interplay between him and the other characters is what makes this book essential for anyone wanting an explanation of this period. The author's journalistic presentation gives us an absorbing account of many fascinating characters set in an era that has continuing implications to this day. I was reminded over the Christmas holidays of Mr. Putin's statement that he wished to return Russia to its 1914 prewar borders. 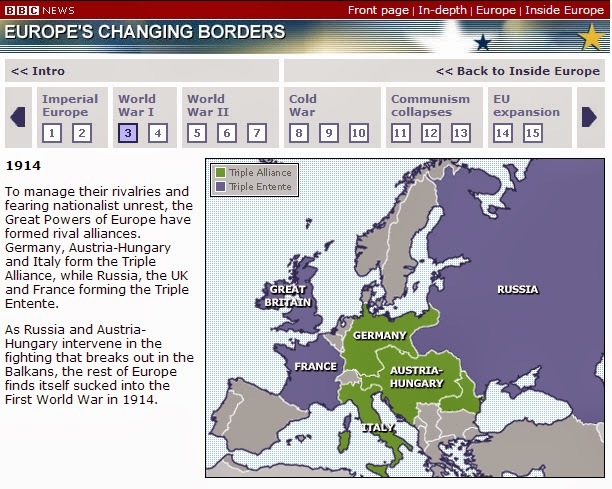 This led me to this excellent online feature from the BBC website that shows the evolution of European borders from 1900 until now in a series of 15 maps. I think you will find it interesting. 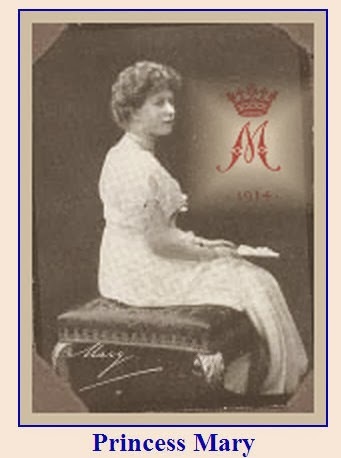 Just click on the link below the 1914 map to start at Map #1, 1900. The Nightmare of Alpine Warfare: Avalanches! During the three-year war in the Austro-Italian Alps at least 60,000 soldiers died in avalanches. [This conservative statistic comes from the research of Heinz von Lichem, in his outstanding three-volume study Gebirgskrieg 1915-1918.] Ten thousand died from avalanches in the "lesser" ranges of the eastern half of the high front – the Carnic and Julian Alps. In the "high" Alps to the west, the Ortler and Adamello groups, the Dolomites, avalanches claimed 50,000 lives. Survival in the high Alps would entail applying a great many methods, from locating the barracks men lived in, to meticulous planning of routes taken on attack or patrol, to the careful consideration of snow and weather conditions. Roofs could be reinforced to survive minor slides, but the best safety came from burrowing under glacial ice or into mountain rock; or, incredibly, building on or below the steepest of slopes, where snow does not accumulate. 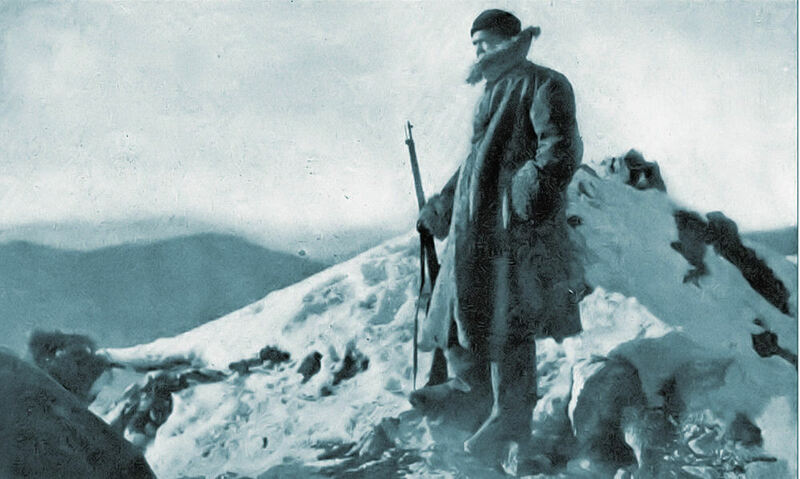 Patrols could cross danger areas one man at a time, with 25-meter intervals and ropes, but larger units of Kaiserjager or Alpini had less choice in tactical movements or during the attack. 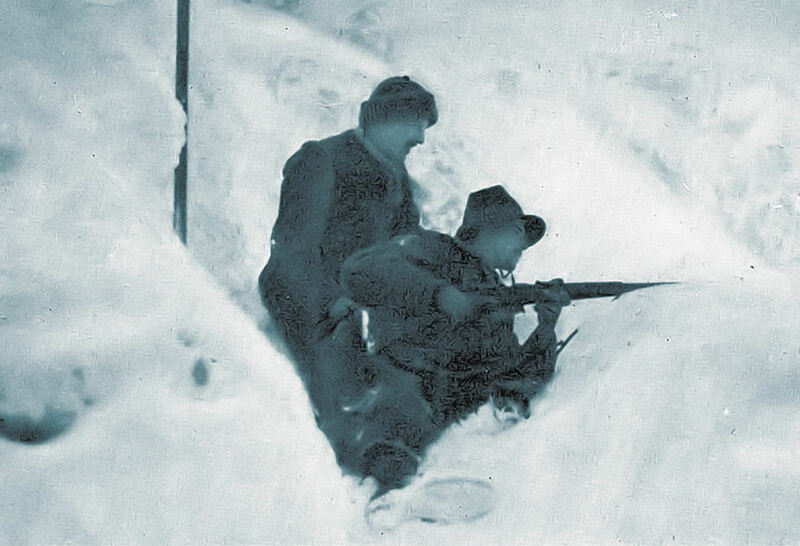 Two of the worst incidents of avalanche on the Alpine front occurred in 1916, when both armies were still adapting to mountain warfare and survival above the timberline. 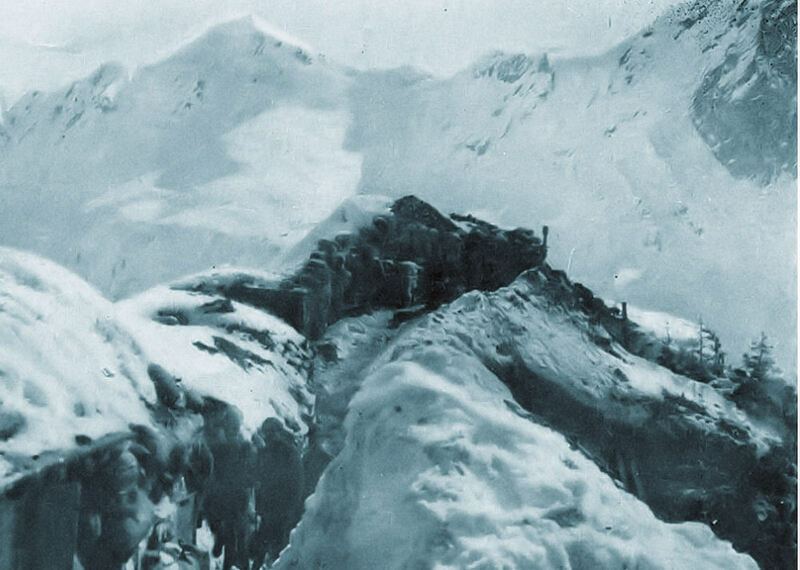 On 13 December catastrophe struck the Austrian barracks below the Gran Poz summit of Monte Marmolada. This encampment had rock cliffs to shield from direct fire, and was out of high-angle [mortar] range. But these defenses from human violence could not protect them from the mountain itself, despite the "city under the ice." Two hundred thousand tons [1 million cubic meters] of snow and ice buried over 500 men. Only 40 bodies were recovered of the estimated 300 who perished. The snow did not cease. Wind and accumulation made the conditions critical, and on 17 December the nightmare began. During the next two days, avalanches would take the lives of 9,000 to 10,000 Italian and Austrian soldiers. Communication lines, fixed ropes, and climbing ladders were swept away, as were entire companies and batteries of men, guns, and mules. In spring their remains were found by the ravens. The total statistics of avalanche and cold, these tens of thousands of casualties of alpine warfare must be considered in one more aspect — that they almost all took place in just two winters. Italy had not entered the war in the winter of 1914/1915 the eastern Alps remained peaceful and quiet. It was the winters of 1915/1916 and 1916/1917 that saw the true extent of "death by nature." The beginning of winter in 1917 saw an almost total collapse of the eastern Alpine front, with the Italian Army's disastrous defeat at Caporetto in October, and the eventual retreat to the distant Piave River. 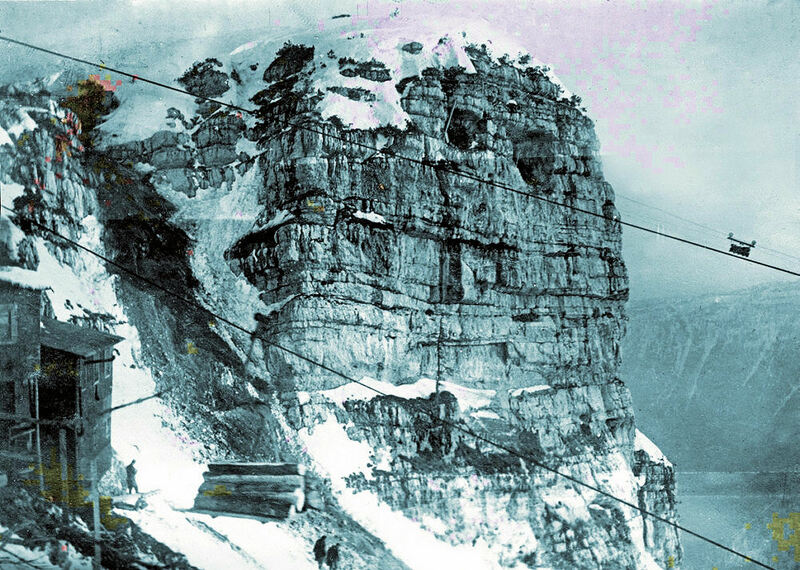 To reinforce this line the Italians withdrew all their troops from the hard-earned terrain of the Dolomites and eastern sub-Alps, as well as rushing units from the northwestern front lines of the Ortler and Adamello ranges. With the momentum of the offensive, the Austrians followed suit. With the high mountains unmanned or abandoned, the casualties due to avalanche dropped considerably in the winter of 1917/1918. Cold would continue to take its toll in the desperate, winter long battles on Monte Grappa and the Altipiano. Prevention was ignored or impossible due to the critical situation at hand. What happened in these highlands was not a skilled battle of mountain troops; there was the slaughter so common to this entire war, events usually reserved for the short summer on this front. Mercifully, the Great War would end before the 1918/1919 winter, and on all fronts the killing and dying came to an end, including the trenches at 10,000 feet. Starting next week and continuing for all of 2014, Roads to the Great War will be taking our readers on a tour of the Western Front. As regular readers know, I have been leading battlefield tours for many years mostly to the Western Front, but also to Gallipoli and the Italian Front. 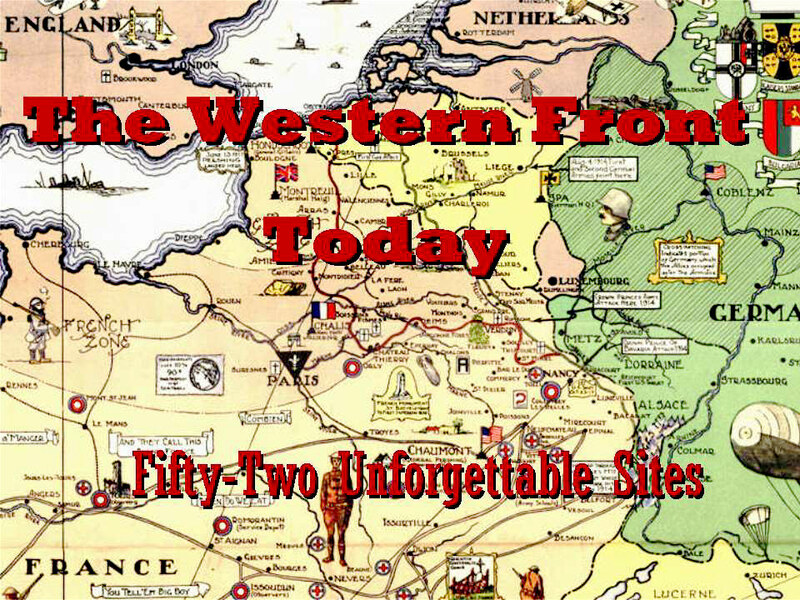 As of 3 January 2014, start dropping in every Friday and begin learning about each of my 52 favorite sites on the Western Front. We will have our usual high quality images and an essay on each stop. Photos from Steve Miller's collection. 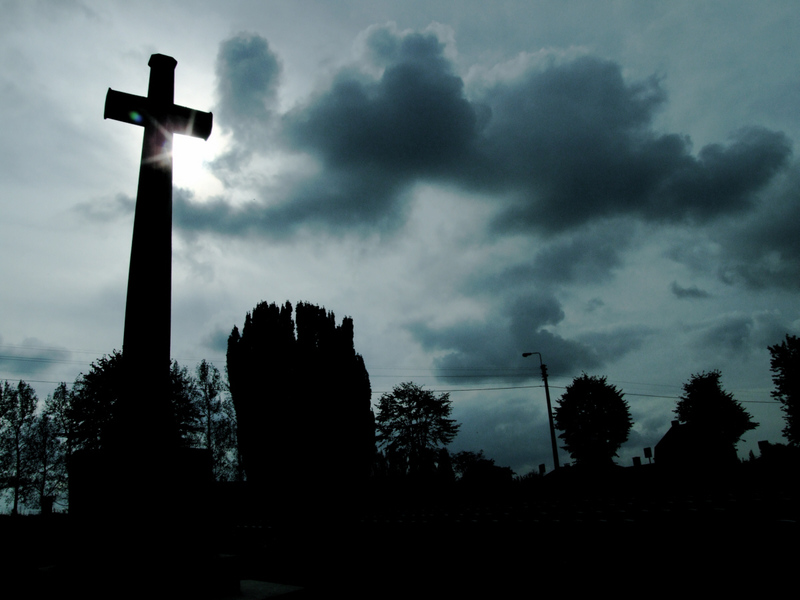 Why Was the Passchendaele Battlefield Such a Nightmare? Had I a descriptive pen I could picture to you the squalor and wretchedness of it all and through it the wonder of the men who carry on. . .A desolate wilderness of water filled with shell craters, and crater after crater whose lips form narrow peninsulas along which one can at best pick a slow and precarious way. Here a shattered tree trunk, there a wrecked 'pill-box', sole remaining evidence that this was once a human and inhabited land. 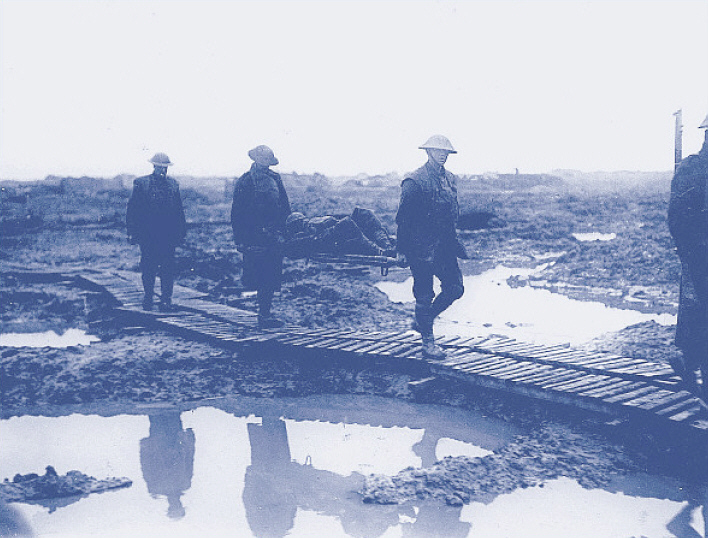 The vast field of shell-holes had been turned into a sea of mud by the heavy rain…Its depths were particularly dangerous in the low-lying ground of the Paddebeek. On my zigzag course I passed many a lonely and forgotten corpse. Often only a head or a hand projected from the shell-hole whose circle of dirty water reflected them. Thousands sleep like that, without one token of love to mark the unknown grave. The shapeless Ridge had lost every tree; . . .flayed and clawed up, (it) was traversed by no (known) likeness. . . Waiting there in the gashed hillside we looked over the befouled fragments of Ypres, the solitary sheet of water, Zillebeke Lake, the completed hopelessness. The most important factor in turning the campaign into a paradigm of the horrors of war was the unusual weather. That 1917 was unusual is beyond doubt, but it was not so outlandishly strange as to be impossible to contemplate in advance. It was coupled with the particular geology of the region, which was certainly known long before the war, but that again had to be coupled with the new brutality of the artillery barrage. Both in terms of quality and quantity, artillery had been revolutionized since the outbreak of the war, and the combination of these factors produced the fearful conditions on the ground that caused so much hardship and loss. Just received at long, long last, a letter from you, the first in three weeks, so you can just imagine how awful glad I was to get it. . .
Well, must tell you about Xmas. Unfortunately most of the things we had counted on having didn't come in time (that's what usually happens), and among the things that didn't come in time was the turkey for the Xmas dinner, but we substituted chicken for the nurses and the quarter master succeeded in getting goose for the patients, but we were rather disappointed not to have turkey for the patients, as the nurses, officers and men had given the money to buy the turkey, and we wanted them to have it. The Christmas bags that had been packed in Phila. didn't come, but we managed to have a nice Xmas. It was a fairly nice day and we had a party for the whole unit on Xmas eve. 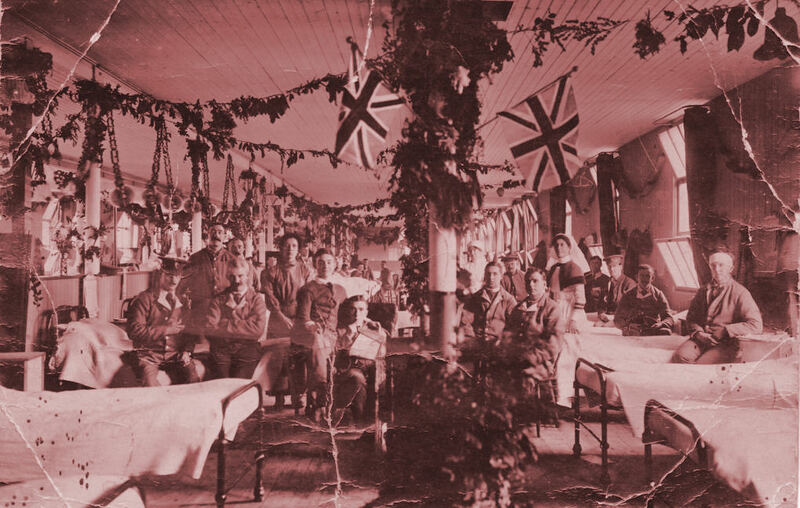 I did not go, but they said it was very nice and a choir of our nurses and some of the English men went all around the wards, and even came over to the officers and nurses mess and sang Xmas carols Xmas eve. Then the nurses got up at 5:30 a.m. Xmas morn and made rounds in all the wards, singing Xmas songs. Of course, all the wards were decorated and we managed to find some little thing for each one of the patients. Then Xmas p.m. the officers gave a tea for the nurses and had real ice cream, which wasn't exactly like home, but tasted mighty good even at that. But I was a lucky girl. I hadn't touched either of the boxes Edna sent me so I had them to enjoy Xmas day, and there were such nice things in them. A pair of the warmest slippers, pale blue, and a pair of white silk stockings and a little electric candle that will be so useful here. Then in the other box she had a perfect fruit cake and a big tin of home made candy and salted peanuts. In spite of the fact that I had kept those things for over two months, they were just as soft and fresh as could be. Everybody raved about that candy. Part of the fruit cake I gave to Miss Dunlop and the rest I wrapped up in a dandy cloth and am going to keep it a while longer. Miss Dunlop and several of the girls each gave me very pretty handkerchiefs, Major Harte gave me fruit, and Wagner gave me perfume, so I had a very nice day. The remarks you made about ____ sounds just like her, but I admire the rest for their attitude because what the Red Cross and the Y.M.C.A. are doing for us over here means so much to us. Really, it would be awful to get along without the things they send us and most of the pleasure that the troops get are the ones provided for them by the Y.M.C.A., and if you could see what these boys have to go through sometimes I think even she might be willing to do without a banquet to help, as we share to give them any comfort possible. 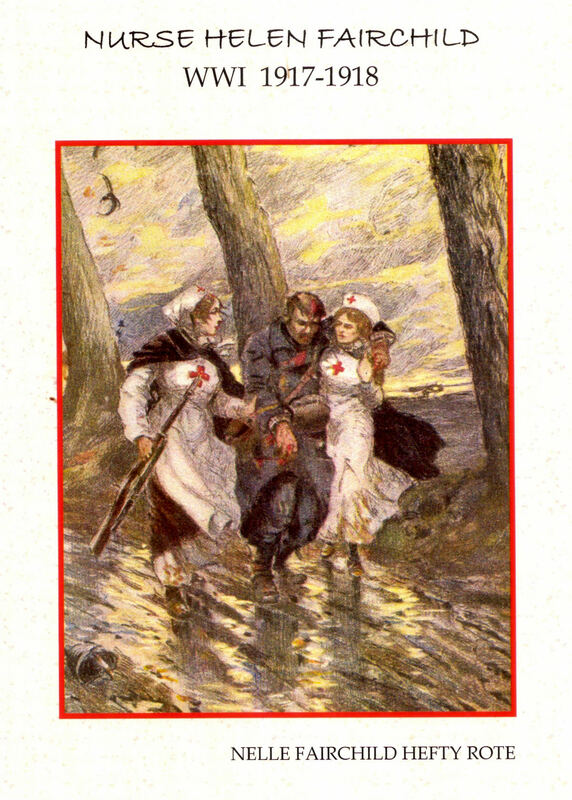 If the time ever comes when some of our own are sent over here I guess she would be glad to have them taken care of when they are wounded, and without the supplies sent by the Red Cross Society, we could not do half as much for them as we are. . .
"I want you now to help me to send a Christmas present from the whole of the nation to every sailor afloat and every soldier at the front. 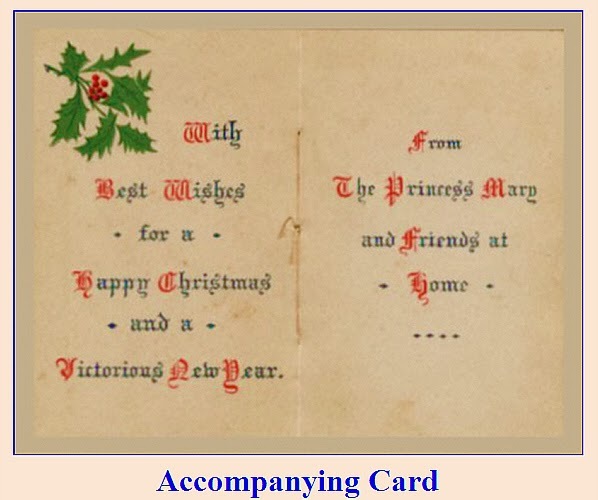 I am sure that we should all be happier to feel that we had helped to send our little token of love and sympathy on Christmas morning, something that would be useful and of permanent value, and the making of which may be the means of providing employment in trades adversely affected by the war ... Please will you help me?" 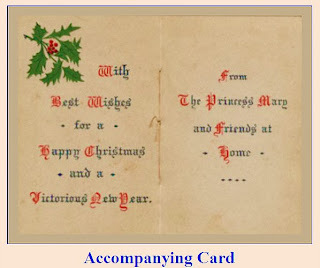 Smokers received tobacco, a packet of cigarettes, a tinder, and a pipe; a photo of Princess Mary and a Christmas card from her. Non-smokers received a bullet pencil in a .303 cartridge, the photo and Christmas card, a khaki writing case, and a packet of acid tablets. 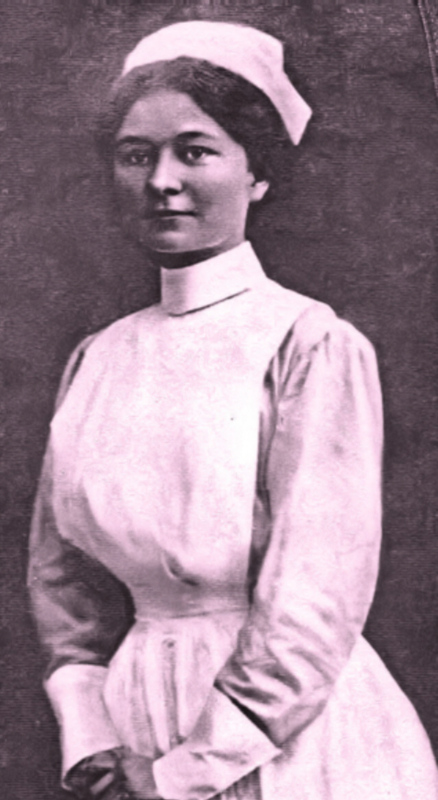 Nurses received chocolates in their box, along with the photo and card. The various Indian servicemen received gifts in accordance with their dietary and/or religious observances, often sweets and spices instead of tobacco. 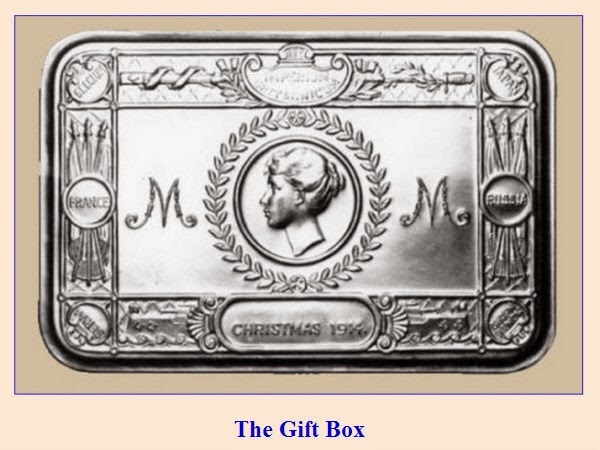 By Christmas of 1914, approximately 355,000 boxes had been distributed. 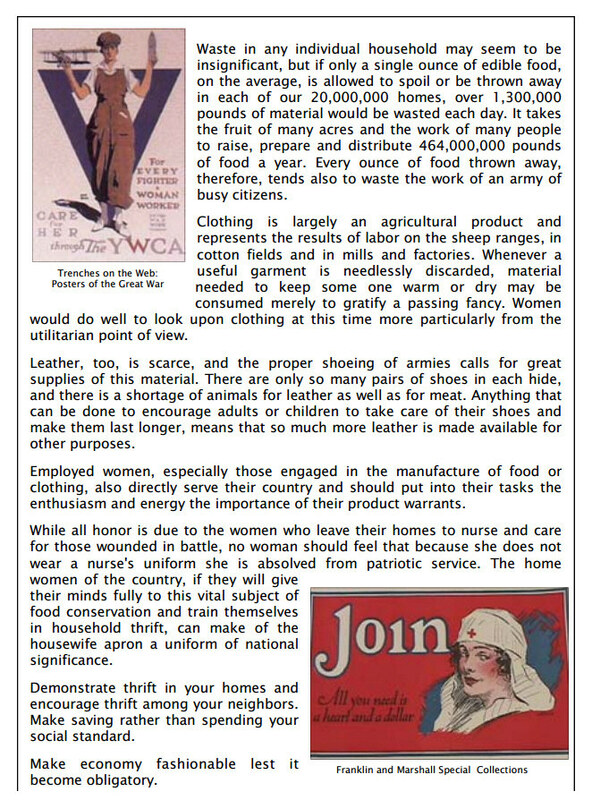 Given the extensive fronts across the globe, it took well into 1916 to distribute all the boxes to those entitled to them; during that time war widows were included in the recipients. Ultimately, 2.5 million boxes were made, filled, and given out. Many were carefully sent home from the front as keepsakes. Princess Mary continued her connection with the armed services throughout her life (1897-1965), becoming colonel-in-chief of the Royal Scots (1918) and of the Royal Signal Corps (1935) in addition to several Commonwealth corps and regiments. 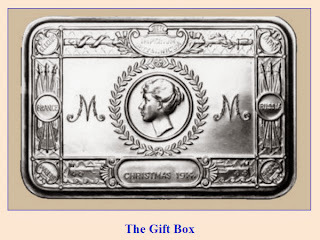 The legacy of the Princess Mary box is a genuine testament to her spirit of public service. The centenary of World War I is on the horizon in 2014 and an abundance of new books arrives in bookstores with regularity. Some of these are rehashed classics or revised general histories full of glossy pictures and maps. Many of the recently published works like Sleepwalkers by Christopher Clark, or Dance of the Furies by Michael Neiberg, revisit the causes and events leading to the tragedy of the war. 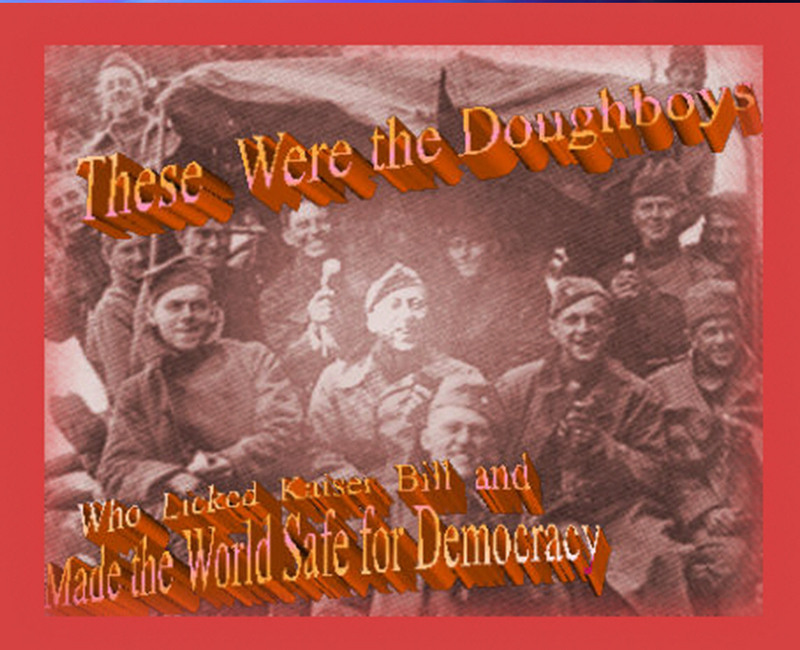 The Last of the Doughboys is neither glossy nor attempts to address the causes of the war. Rather, it is a blending of the lives of the last American veterans with effective narration of the events in Europe and at home as the war unfolded. This combination makes a captivating read, as you can hear the words of veterans over 100 years old who led ordinary lives over an extraordinary time. 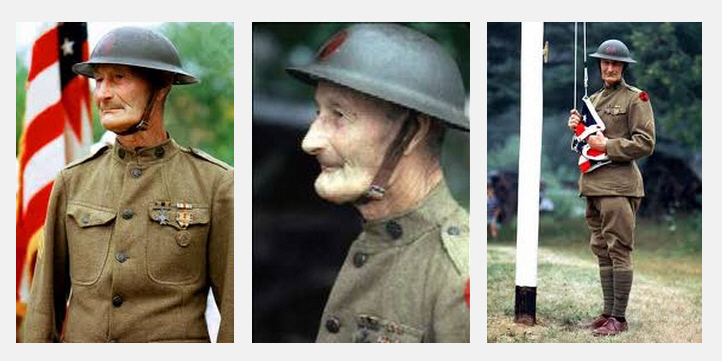 Each veteran is remarkable in their own right, ranging between the ages of 103 and 113 years old. Many of the stories are disconnected or are incomplete, as can be expected of 85-year-old memories. However, others are as vivid as if the events unfolded recently. Consistent throughout the book is Richard Rubin's patient questioning as they provide their recollection, and as he fills in the narrative with the events and culture of a forgotten generation — the Lost Generation. The oral histories of the WWI veterans are plentiful in Europe because of the tremendous human costs and the ground that still bears the scars of battle. Rubin's Last of the Doughboys follows recent British books in publishing the last of the oral histories of a generation. The previous books, however, had the advantages of thousands of hours of oral interviews as a starting point from the Imperial War Museum in London. Max Arthur even interviews many of the last surviving British veterans in his Last Post. However, to Americans, The Last of the Doughboys should hold special meaning and interest in its own right. America had forgotten this generation of soldiers following World War I, and in fact, Richard Rubin's starting point was not American at all. In 1998 the French Government went to great lengths to award the Legion d 'Honneur to living Americans who had fought on French soil. It is from this French list that the author was able to find the majority of the last of a generation of Americans from our own country's forgotten war. The author has varied success with some of the interviews and at times weaves in more historical context than veterans' personal experiences. All chapters have special meaning, but the most engrossing chapter contains the concluding interview. While most of the stories are snapshots of the veterans' war years, the last chapter illuminates the extraordinary life of the last Doughboy, Mr. Frank Buckles. Frank Buckles lived to 110 years old and was vibrant every day until his passing in 2011. The many interviews by the author covered not only Buckles's war service, but also his life from birth until the end, highlighting the amount of change and events Mr. Buckles experienced over the 20th century. For example, while traveling the globe in the interwar years in a life of adventure, Mr. Buckles was in the Philippines when the Japanese invaded in World War II. The story of his three-year imprisonment at Los Banos and eventual rescue by American paratroopers at the end of the war is gut wrenching and a testament to a true survivor. Lastly, Richard Rubin provides a fascinating addition to The Last of the Doughboys. Each of the interviews are taped and many available online at www.richardrubinonline.com. The combination of the book with the companion interviews online entices a casual reader to continue to explore the Great War and remember the last American Doughboys' contribution to this nation's defense. With this article we begin presenting a new series on World War I murals from around the world. Alfred Bastien was a well known and successful Belgian artist prior to the Great War. He helped complete the successful Panorama du Congo, exhibited at the 1913 Ghent World Fair, which was a prequel of sorts to his grand postwar Panorama de l'Yser, undoubtedly his most famous and acclaimed work, if not the most artistically accomplished. After serving in the Garde Civique like many other Belgians, Bastien fled to Great Britain after the fall of Antwerp in October 1914 and despite his age (43) volunteered for the Belgian Army. He was eventually transferred to the Section Artistique in Nieuwpoort along with many of his prewar artist friends and acquaintances. 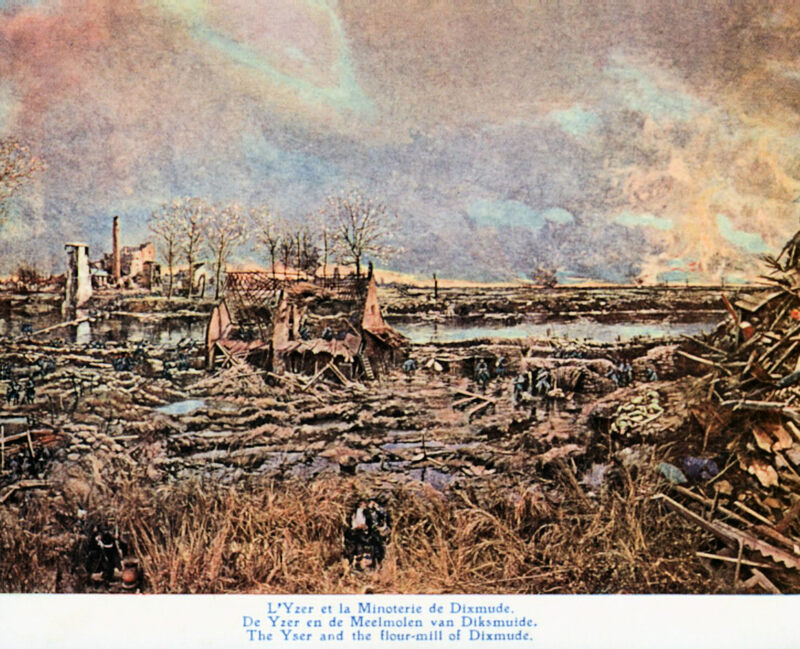 From 1915 onward, he made many drawings and sketches of the situation on and behind the Belgian lines on the Yser river. 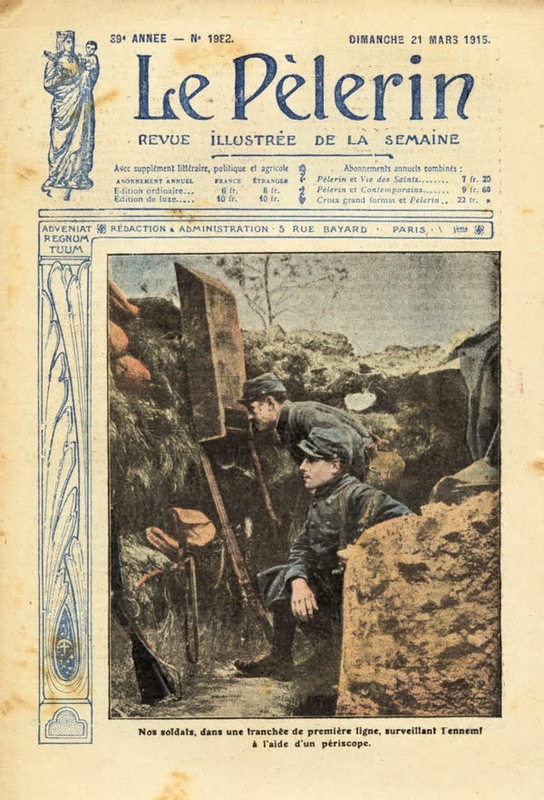 The British wartime magazine Illustrated War News, among others, regularly published his work, quite often in distinctive and semi-panoramic, multi-color two-page spreads, of which several are shown above. In 1917, on personal request by Lord Beaverbrook, who owned several of Bastien's prewar paintings, he was seconded to the Canadian Army until September 1918, during which time he produced many works of art specifically related to the Canadian war experience. After the war, Alfred Bastien painted a grand panorama of the Yser Front in 19th-century tradition, a project he had been planning since 1914 and which, according to his own telling, had been suggested to him by King Albert in 1914. During his wartime service in the Belgian Army Bastien made many sketches, drawings, and photos that were later either incorporated into the Panorama itself or were useful studies in technique and effects. Several of such drawings are shown above. The Panorama de l'Yser painting itself measured 115 meters in length and 14 meters in height and was initially exhibited in Brussels. In the mid 1920s, a permanent building was constructed in Ostend to house the Panorama along with a multitude of props and decor. The intention of moving the Panorama to Ostend was to capture a share of British "war-tourism," since most British coming to visit relatives' war graves arrived by steamer in Ostend before proceeding to the area of the Ypres Salient. The Panorama opened at Ostend in 1926. Here are four details from the mural. While the intent was to provide spectators with a sense of "being there" on the Yser Front in person, the depiction of the landscape, while extremely realistic in terms of style and detail, was not an actual view that could have been seen at any time during the war. 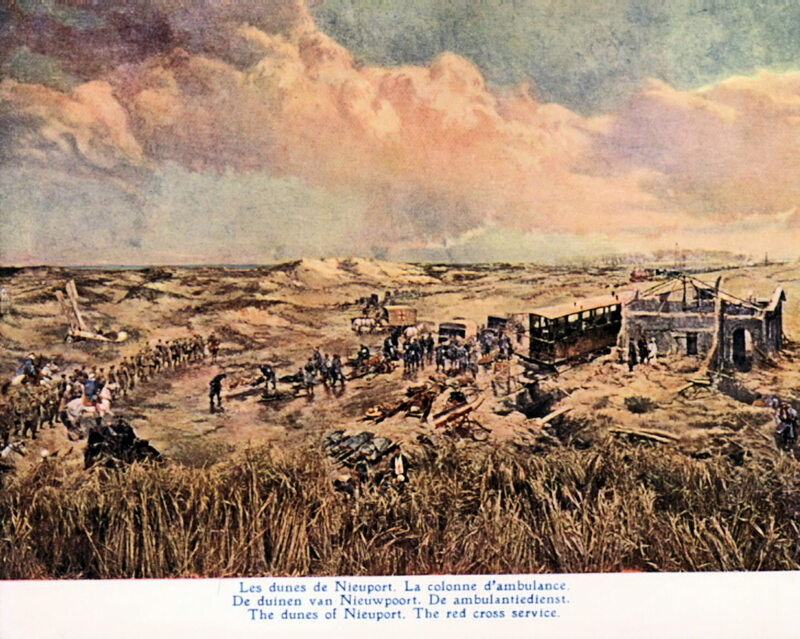 The Panorama not only depicted various battles and incidents from the Yser Front in Belgium in 1914 and 1915, but the central viewpoint from which spectators viewed the battlefield was also an imaginary place. For nowhere in all of Belgium could all the landscapes and towns and villages and rivers have been seen in real life. Just as cyber artists nowadays create "virtual realities" that appear to be highly realistic, back in 1920 Belgian artist Alfred Bastien created a virtual reality scene in which he tried to portray all the drama and heroism of the Yser Front in Belgium. Financially the Panorama was great success, for Bastien, who received a tremendous fee for the painting; for the consortium of businessmen and banks that provided funds and capital; and for the city of Ostend, which provided real estate and a newly constructed building to house the Panorama. The initial investment was repaid many times over, from entrance fees and from (by modern standards) modest merchandising of postcards and prints. To give a relative idea of the finances involved, the actual cost of the painting materials (oil paint, linen, brushes etc.) was estimated at around 40,000 BF, the cost to construct the new building at Ostend was 550,000 BF, and Bastien's fee itself was set at 350,000 BF. Entrance fees for customers was 3 BF. While on exhibition in Brussels until 1925 it is estimated that more than 800,000 customers visited the Panorama, amongst them many of the crowned heads of Europe, presidents and foreign emperors alike, all to great acclaim by the news media. Of course in completing a work of such dimensions it is obvious that Bastien could not do all the painting himself. Several of his wartime friends and fellow artists from the Section Artistique participated in this grand project. The initial sketching in of the broad outline in charcoal of the Panorama took about a week's time to complete, while the actual painting and varnishing took one year's time. The Panorama was set up in a circle, with paying spectators having a viewing place in the center. Careful attention was given to the lighting effects and the placement of objects in the foreground, in order to create a more believable optical illusion. Many postcards and quality prints in all sizes and colors were made of this early 20th-century artistic extravaganza. The scans in this section are from a series of large-sized color postcards. Aside from his, famous Panorama de l'Yser, exhibited in Brussels, Bastien also created a smaller sized Panorama de la Bataille de la Meuse in 1937 which showed an amalgam of scenes from the fighting in Namur and the Citadel of Dinant during August 1914. 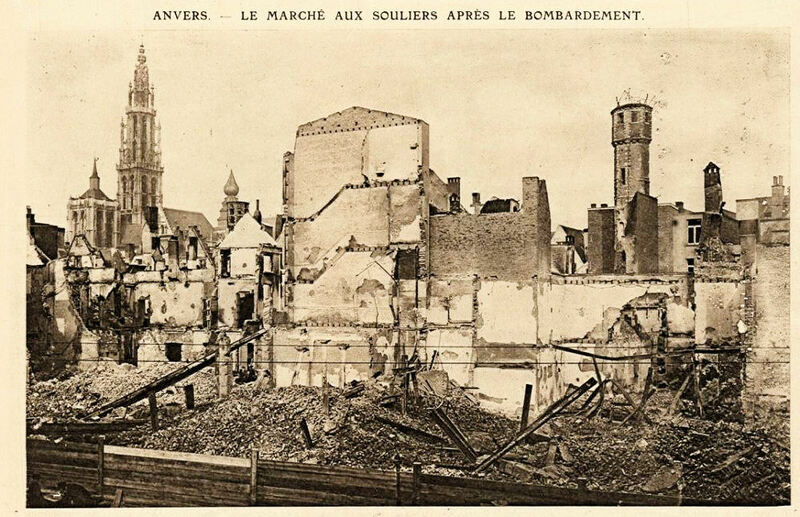 Part of this panorama, which depicted the massacre of Belgian civilians in Dinant in August 1914, was deliberately destroyed by German authorities during the 1940–44 occupation. The Panorama de l'Yser was heavily damaged in 1940 during a bombing raid by British aircraft. The museum was closed during the war years and the painting was exposed to all manner of adverse weather conditions. In 1951 the work was moved into the Royal Army Museum in Brussels where a preliminary restoration was undertaken. Afterward it was exhibited in the Army Museum until 1980. Subsequently the painting has remained in storage, awaiting further restoration and a definitive destination. It is hoped that a careful restoration and a permanent place of exhibition for the sole remaining Great War Panorama will be a fitting part of centennial celebrations in 2014. During World War I, in an effort to conserve fuel needed to produce electric power, Germany and Austria took time by the forelock and began saving daylight at 11 p.m. on 30 April 1916, by advancing the hands of the clock one hour until the following October. This 1916 action was immediately followed by other countries in Europe, Belgium, Denmark, France, Italy, Luxembourg, Netherlands, Norway, Portugal, Sweden, and Turkey, as were Tasmania, Nova Scotia, and Manitoba. 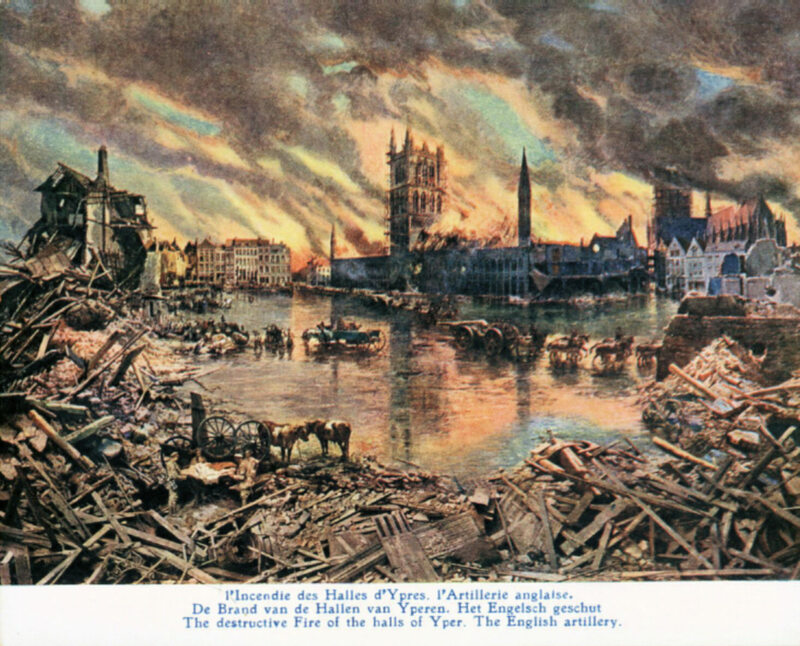 Britian began three weeks later, on 21 May 1916. In 1917, Australia, Newfoundland, and Nova Scotia initiated it. The plan was not formally adopted in the United States until 1918. 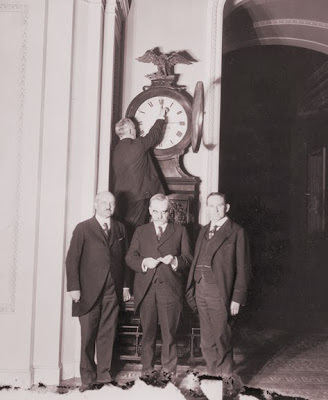 "An Act to preserve daylight and provide standard time for the United States" was enacted on 19 March 1918. Senate Sergeant at Arms Charles P. Higgins turns forward the Ohio Clock for the first Daylight Saving Time, while Senators William M. Calder (NY), Willard Saulsbury, Jr. (DE), and Joseph T. Robinson (AR) look on, 1918. Daylight Saving Time was observed for seven months in 1918 and 1919. After the war ended, the law proved so unpopular (mostly because people rose earlier and went to bed earlier than people do today) that it was repealed in 1919 with a Congressional override of President Wilson's veto. Some citizens had protested the law, using the slogan, “Give us back our stolen hour.” Daylight Saving Time became a local option and was continued in a few states, such as Massachusetts and Rhode Island, and in some cities, such as New York, Philadelphia, and Chicago. But the allure of Daylight Saving Time would prove irresistible. During World War II, President Franklin Roosevelt instituted year-round Daylight Saving Time, called "War Time," from 9 February 1942 to 30 September 1945. [See law] From 1945 to 1966, there was no federal law regarding Daylight Saving Time, so states and localities were free to choose whether or not to observe Daylight Saving Time and could choose when it began and ended. This understandably caused confusion, especially for the broadcasting industry, as well as for railways, airlines, and bus companies. Because of the different local customs and laws, radio and TV stations and the transportation companies had to publish new schedules every time a state or town began or ended Daylight Saving Time. Andrew Wyeth saw first saw World War I veteran Ralph Cline in a Veterans Day parade and realized that the old soldier was the epitome of a proud and patriotic American. Wyeth described his Maine neighbor as, "Absolutely the patriot. The American flag means everything to him. Kind of man that fought at Concord Bridge." In 1964 Cline sat for this portrait that came to be titled the Patriot. The portrait was featured in Life magazine, on television, and was hung for a time at West Point. It's in a private collection today, but prints of the painting can be found online. The subject, Ralph Cline (1895-1976), enlisted in April 1917 and served in the 64th Infantry, 7th Division of the AEF, which was in action the last days of the war in the St. Mihiel sector. After the war, he returned to Maine for the rest of his life working first as a lobsterman and then settling on operating a sawmill. He married Miriam Crockett in 1927; they had three children together and remained married for fifty years. 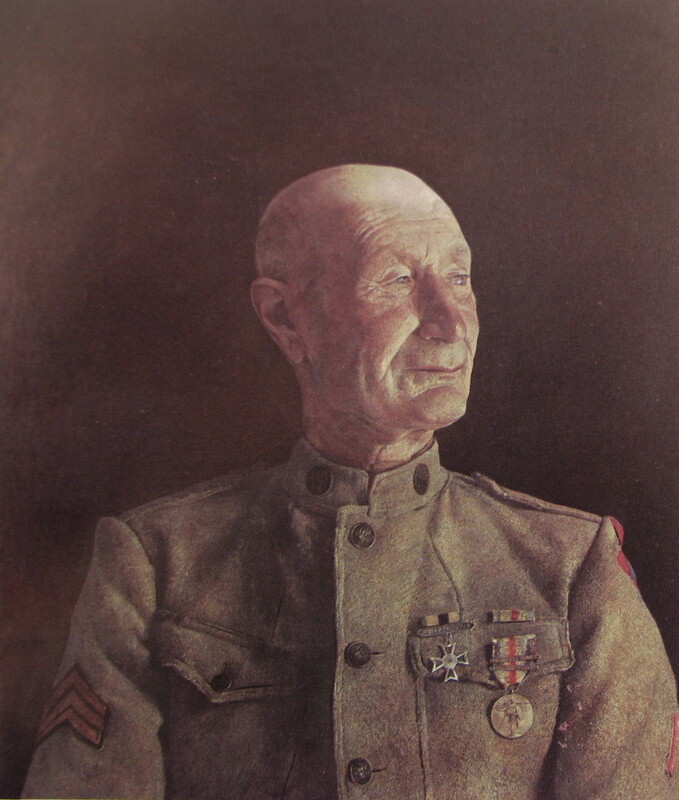 During World War II, Cline served in the Maine State Guard Reserves, a militia unit formed to replace the state's National Guard troops, who had been called to federal service. Later, both his son Ralph, Jr., and grandson, Ralph III, followed the family tradition of military service. And the bombs explode with a sickening crash. Till at last they waver, and turn, and reel. By God, you've stuck to your trench! You'd your bayonet clean, and your bolt" worked true. And he's lying there, with his brains in the muck. Yes, save your life in the trench. In living through this "great epoch," it is difficult to reconcile oneself to the fact that one belongs to that mad, degenerate species that boasts of its free will. How I wish that somewhere there existed an island for those who are wise and of good will! In such a place even I should be an ardent patriot! Ever since [being appointed a dispatch runner], I have, so to speak, been risking my life every day, looking death straight in the eye. . . It is a sheer miracle that I am hale and hearty. At 4:40 p.m. the Scharnhorst, whose flag remained flying to the last, suddenly listed heavily to port, and within a minute it became clear that she was a doomed ship ; for the list increased very rapidly until she lay on her beam ends, and at 4:17 p.m. she disappeared. . .
At 4:40 p.m. the Scharnhorst, whose flag remained flying to the last, suddenly listed heavily to port, and within a minute it became clear that she was a doomed ship ; for the list increased very rapidly until she lay on her beam ends, and at 4:17 p.m. she disappeared. Scots and Huns were fraternizing in the most genuine' possible manner. Every sort of souvenir was exchanged, addresses given and received, photos of families shown, etc. One of our fellows offered a German a cigarette; the German said, 'Virginian?' Our fellow said, 'Aye, straight-cut:' the German said, 'No thanks, I only smoke Turkish!' ... It gave us all a good laugh. A German NCO with the Iron Cross – gained, he told me, for conspicuous skill in sniping – started his fellows off on some marching tune. When they had done I set the note for The Boys of Bonnie Scotland where the heather and the blue bells grow, and so we went on, singing everything from Good King Wenceslaus down to the ordinary Tommies' song, and ended up with Auld Lang Syne, which we all, English, Scots, Irish, Prussians, Wurttembergers, etc, joined in. That we had lost our self-possession, that we had been thrown off our balance by a war with which we have nothing to do, whose causes can not touch us, whose very existence affords us opportunities of friendship and disinterested service which should make us ashamed of any though of hostility or fearful preparation for trouble. Today is the 97th anniversary of the conclusion one of the signature battles of the Great War, the 1916 struggle for Verdun. 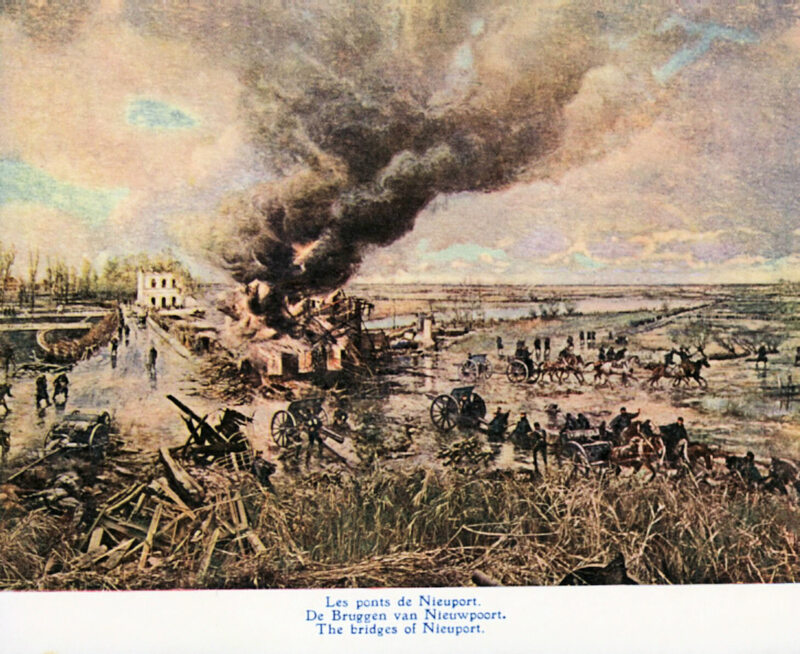 We have covered this famous battle – the war's longest – in earlier entries on Roads and will do so in the future, but to commemorate this anniversary I thought some information on its heritage, the casualties, and some images of the combatants might be in order. 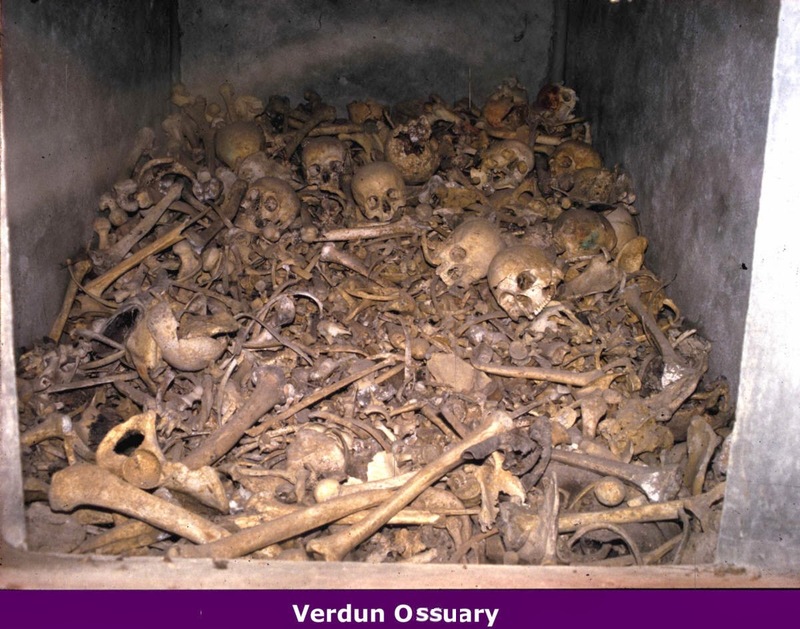 The battle of Verdun is the battle of France. It's a place of the identity of France, of France-ness, I would say. There was no battle before, and no battle after, which was so important in the French memory. So, you can't understand France without understanding Verdun. I think that in the total war, the battle of Verdun was a total battle. I think that French soldiers were perfectly aware of the meaning of the battle. In their eyes, the battle was a defense of their women, their wives, the children, the French religion, the French soil. 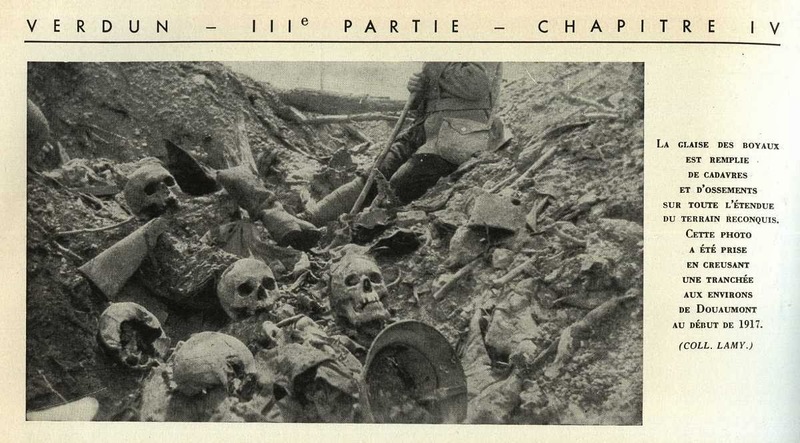 It looks very strange to us now, but for the French soldiers of 1916, it was very clear to them. The battle had real meaning. It's good to recall, as one commentator put it, Verdun was conceived as a battle of attrition, and it is history's most memorable monument to the pointlessness of that strategy. 1. The battlefield was only about 50 sq. miles (30 sq. miles on the right (west) bank, 20 sq. miles on the left. 2. By one estimate 40 million artillery shells were fired in this area over about 300 days. 3. 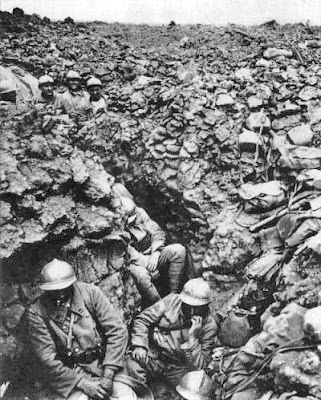 Pétain's policy was to rotate in troops, so about two-thirds of all French divisions served at Verdun. The German Fifth Army facing them, however, left units in place; consequently, a smaller percentage of German soldiers shared the "Verdun Experience" than did France's soldiery. 4. 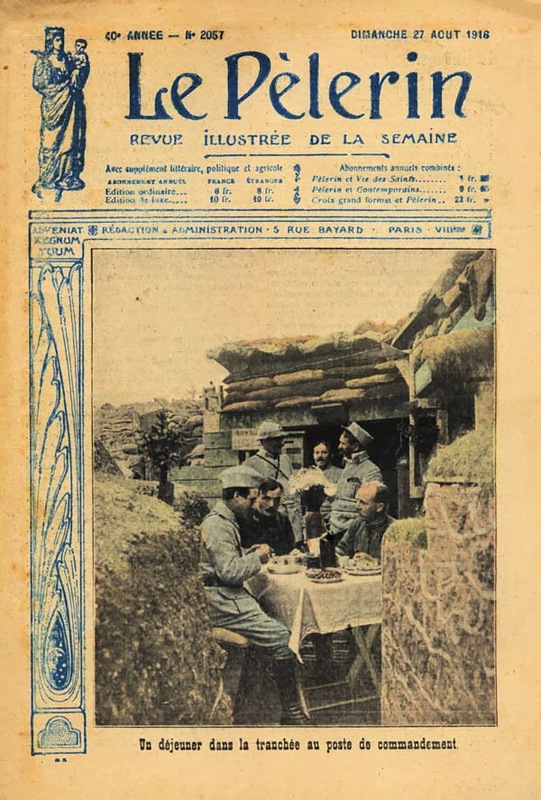 This intense "Verdun Experience" for France led to the ascendancy of General Pétain (long term and ultimately catastrophic) and General Nivelle (short term and soon disastrous); the ill discipline of 1917 after the April offensive along the Aisne; and the Maginot Line strategy that would result in the 1940 defeat. Tirpitz and the Imperial German Navy is another book to read to understand factors contributing to the ignition of WWI. The author, Patrick Kelly, has researched this book with impressive detail and written it with piercing analysis. 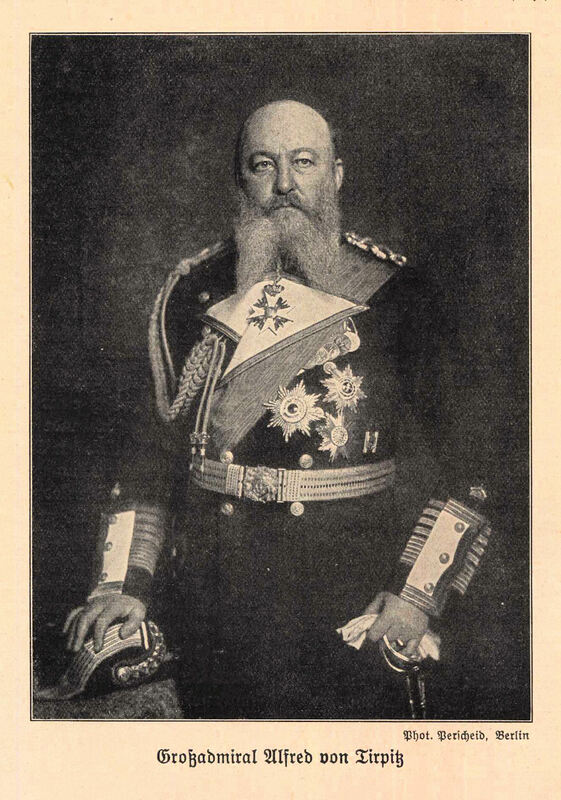 The book has four major sections: the youth and maturing of Alfred Tirpitz (1849-1930) as a naval officer, including an undistinguished performance in Asia; his service as state secretary of the Imperial Navy Office; WWI with its frustrations and his declining influence; and a post-war political career. Basically, Tirpitz was a mediocre commander who sought power and jealously protected it while deprecating new ideas and promoting his own. Tirpitz was chiefly responsible for the development of the torpedo as a significant weapon, working for twelve years in the Torpedo Arm Section of the German Navy, 1877-1889. A highlight of the book is an 1879 photograph of a square-rigger, the SMS Zieten, with two torpedo tubes above water on the starboard side. In 1896 Admiral Tirpitz was sent to East Asia to identify a site suitable for a navy base. The challenge of this assignment was compounded by his lack of objectivity and by internal navy politics. Eventually he seized his favorite site, regardless of Chinese concerns. His performance was unimpressive. Upon his 1897 return to Germany, he sought and served as state secretary until 1916. This is somewhat like a uniformed officer being the secretary of the navy. He had much to say about navy expenditures, primarily for building capital ships, which gave him the power he sought. His chief responsibility was to build the fleet, which he did successfully by frequently threatening the Emperor with his resignation, schmoozing with Germany's four political parties, linking expanded international commerce to a more powerful navy, and building a base of navy loyalists. The result was a fierce and expensive buildup of the German Navy into a force that was still outgunned by the British, who had several times as many ships with far greater cruising ranges. Hatred of that power was used to justify the expansion of the navy, although plans for its use were never developed, nor was it used much in WWI. In the meantime, the gradually developing submarine force was ignored. This period of service was when Tirpitz performed best but also when his worst features came to light: a craving for bureaucratic power, a poorly designed fleet with only a North Sea mission, no coherent plan because it would challenge Tirpitz's power, and overall a man with self-interest, not the interest of the Navy. When the war ended naval construction, the Admiral's influence was reduced to very little. He had not commanded anything since 1897, his ideas were ridiculed, and he was basically sidelined. After the war, Tirpitz participated in civilian politics, winning a seat as a deputy in the Reichstag. He was interested in establishing a dictatorship to combat the unrest of that period, but nothing came of it. When investigated for war crimes in 1920 he was found innocent because he had had no authority. Later the Nazis built a fitting memorial to the admiral: a battleship named for him. The British responded appropriately, bombing it to the bottom of a Norwegian inlet. Kelly is to be commended for keeping all of the lengthy and complicated legislative activity straight in this book, but for the reader it is a tough slog. Kelly's last chapter is titled "Conclusion," when actually it is primarily a summary. The reader should review this before taking the time to read the entire book, which perhaps might be considered too detailed for some. The Image of Admiral Tirpitz is from Tony Langley's collection. 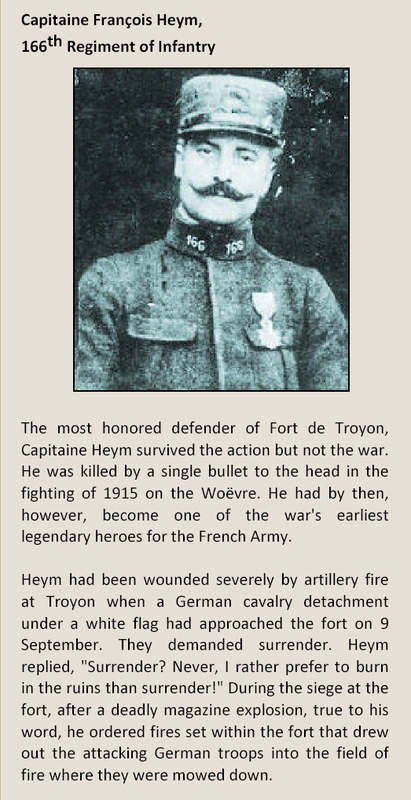 If you are not familiar with the story of the importance of Fort de Troyon's valiant defense — the action simply saved the Battle of the Marne for France. We told the full story in the February 2008 issue of Over the Top, which — as with any of our 84 back issues — is available for $4.50 as a download. Email us for further information and a list of our other issues. 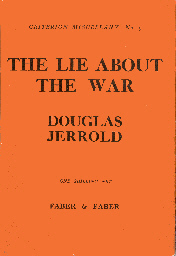 Conservative historian and publisher Douglas Jerrold, a man once described as "an uncompromising controversialist," in 1930 found himself quite dissatisfied with the literature – both fictional and memoirs in the form of novels – taking the war as its subject. He published a scathing pamphlet titled The Lie About the War that grouped together such recent "best sellers," which are now rated the war's "classics," as All Quiet on the Western Front, Good-bye to All That, Under Fire, The Secret Battle, Storm of Steel, The Enormous Room and theSpanish Farm Trilogy, and described what he saw as their common and central flaw. I believe the excerpt below captures the heart of Jerrold's argument. Incidentally, in the 1950s Jerrold became better known for publishing an equally powerful rejection of the works of mega-historian Arnold Toynbee. These books all reflect (intentionally or otherwise), the illusion that the war was avoidable and futile, and most of them reflect the illusion that it was recognized as futile by those who fought it. It is this obsession of futility, not any special depth of sympathy or humanitarianism which accounts for the piling up of the individual agony to so many poignant climaxes remote from the necessities or even from the normal incidental happenings of war. The suffering, the horror and the desolation is presented always and brutally as without a meaning so far as the declared purposes of the struggle are conceived, because these declared purposes are, to the writers and critics of the moment, either so many impudent and deadly frauds or so many irrelevancies, to the achievement of which the blunders and crimes of the military were only so many obstacles. Now these writers are too gifted not to know that if the sufferings of the war were really futile and superfluous or its incidents irrelevant, the sufferings would in themselves be utterly without significance. These writers know as well as I do that the only possible tragedy of the war, considered as war, lay in its inevitability, that to deny the element of fatality must be to deny that it was a tragedy at all. Yet to accept the element of fatality would be to invest the war with a grandeur which these novelists are determined to deny it. Hence the frantic attempt to get the dramatic quality out of every kind of struggle except the struggle of one army against another and so to get a significant novel without having to admit that it was a significant war. The struggle of the coward against fear, of the artist's sensibility and refinement against progressive brutalization, of the brave man against exhaustion, of the 'line' against the Staff, of the amateur against the professional soldier, of the individual against authority, all lead up to and are subservient to the ultimate and wholly mendacious struggle of the man of peace against war [in Remarque's words:] "the fighting, the terror, the mastery, the power and the tenacity of the vital forces of the individual man faced with death and annihilation." To put it another way, perhaps gaining in vividness at the expense of exact analysis, the real tragedy of the war is being falsely reported as the death of so many men whose duty it was to live, whereas the real tragedy was that duty offered no alternative but death. And it was for this reason that death was accepted, not in fear, not in sullen indifference or in open or suppressed revolt, but deliberately and in the face of countless opportunities of evasion. This is where the crime against mere veracity begins to show. To establish the dramatic quality of the secondary and sometimes wholly imaginary struggles which make up the tale of these unmilitary epics, every essential fact is falsified, either objectively or by an illegitimate technique. A French critic [Jean Norton] has accumulated a catalogue of objective errors in some of the more popular works. I hesitate to follow in his footsteps because it is impossible to establish a negative. What is happening today is precisely what happened in 1914 in the matter of the German "atrocities" in England and in 1919 of French "atrocities" in Germany. A grotesque legend is being built up on a slender basis of hearsay. . .
Few countries enjoy the bonds of goodwill and friendship that the United States and Canada share. Our common border remains the longest unguarded frontier on earth, and our nations have shared triumphs and tragedies throughout history. 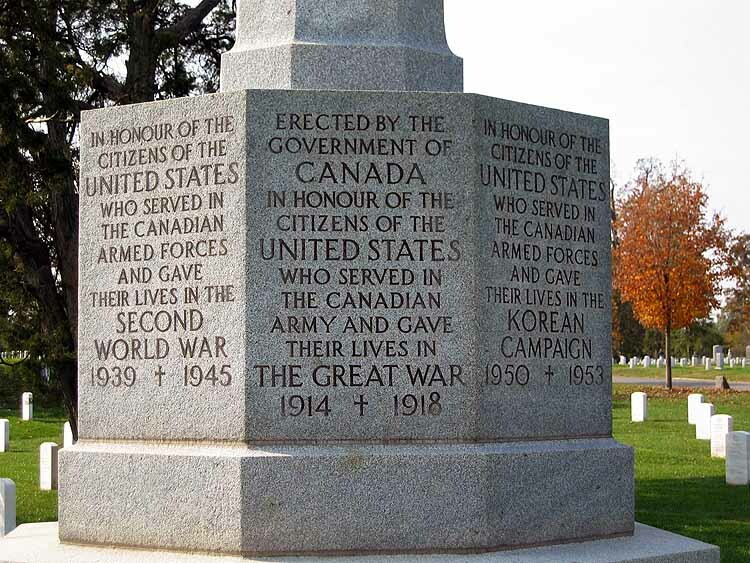 It was in this spirit of friendship that in 1925 Canadian Prime Minister MacKenzie King first proposed a memorial to the large number of United States citizens who enlisted in the Canadian Armed Forces and lost their lives during World War I. Because the Canadians entered the war long before the United States, many Americans enlisted in Canada to join the fighting in Europe. On 12 June 1925, President Calvin Coolidge approved the request, and on Armistice Day 1927 the monument near the Memorial Amphitheater was dedicated. Designed by British architect Sir Reginald Blomfield, the monument consists of a bronze sword adorning a 24-foot gray granite cross. 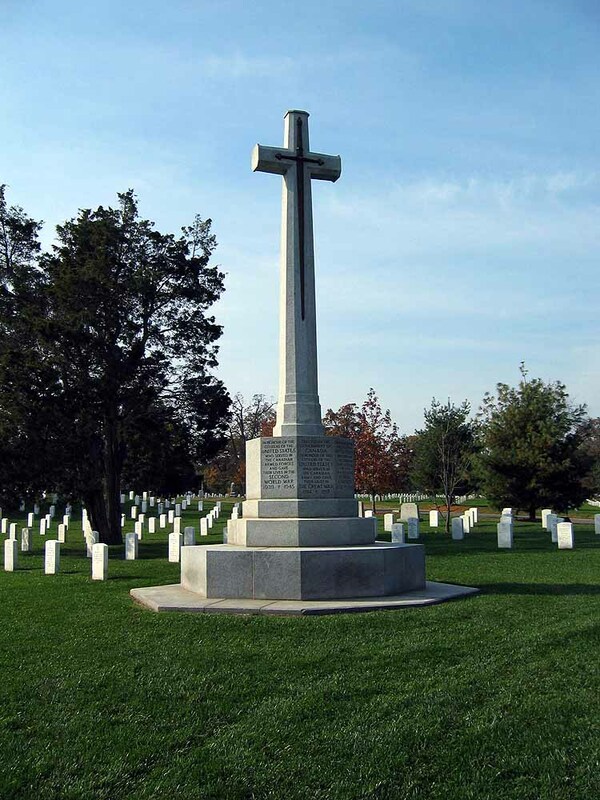 The inscription on the cross reaffirms the sentiment expressed by Prime Minister King regarding Americans who served in the Canadian Armed Forces. Following World War II and the Korean War, similar inscriptions on other faces of the monument were dedicated to the Americans who served in those conflicts. Quoted from: Peters, James Edward. Arlington National Cemetery: Shrine to America's Heroes. 2000. 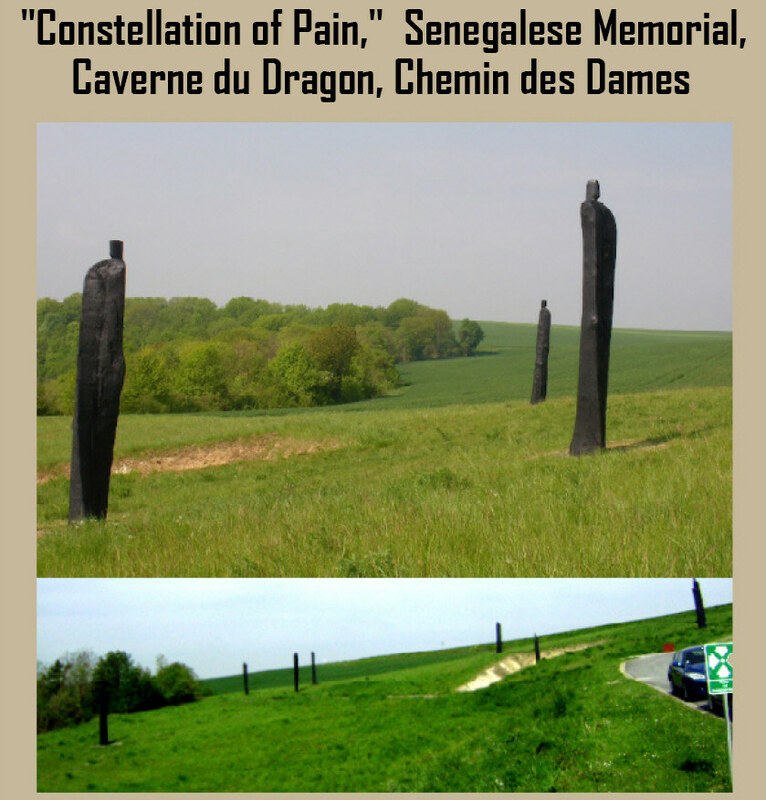 Above the famed Caverne du Dragon situated on the Chemin des Dames are nine tall black abstract figures made of calcified wood that seem to be rising from the ground. These thick columns with tiny heads atop are artist Christian Lapie's acknowledgement of the tragedy that befell the colonial Senegalese troops of the French Army at this site. On the morning of 16 April 1917 more than 15,000 of the Senegalese infantry attacked here. Over 1,400 of them died that day. The artwork was dedicated on the 90th anniversary of the tragedy in 2007. As readers of Roads to the Great War have probably figured out, I simply find the Great War endlessly interesting. Words, however, sometimes escape when I try to explain my interest to others. 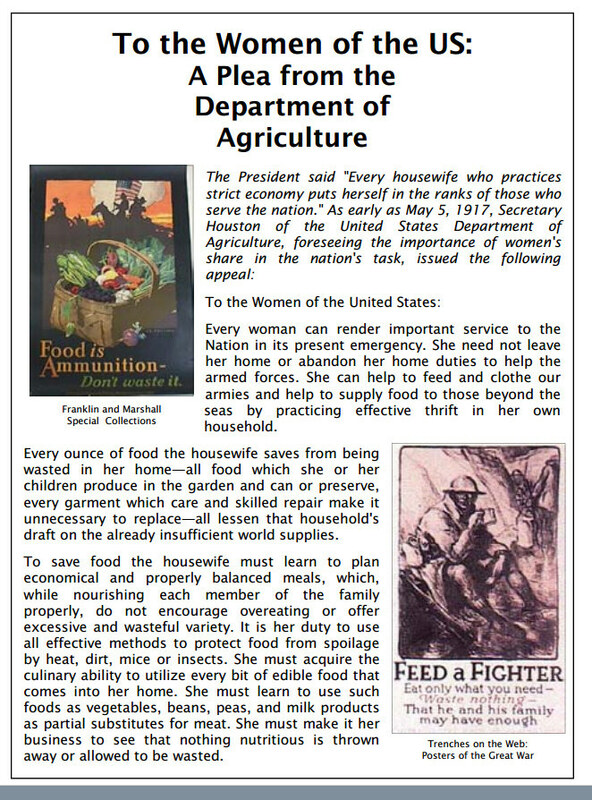 I found this on the website of the U.S. National Archives and I think this says much of what interests me. 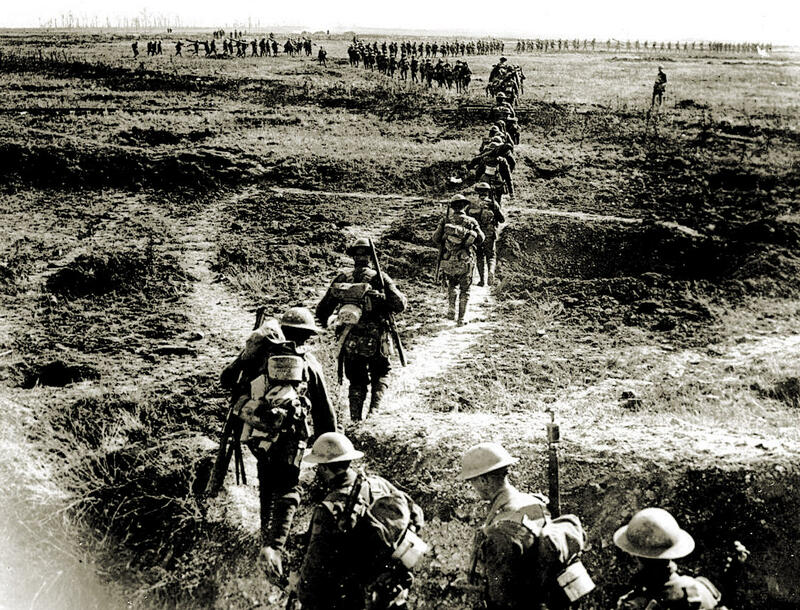 World War I is the cradle of modern civilization. More than any other event, it shaped the 20th century, toppling kings, ushering in the Soviet Union, transforming relations between and within nations. The first truly mechanized war, it was fought with poison gas and bombs dropped from the air, with tanks and machine guns and in trenches stretching for 600 miles. Offsetting the lethal ingenuity of modern mass warfare, the Great War also inspired unforgettable songs, poetry, and literature. Words like liaison, Tommy, and doughboy enriched the popular vocabulary. On the homefront, Americans saw their government swell to a cost and scope never before imagined. Self-denying patriotism spawned Meatless Mondays and Wheatless Wednesdays, and sugarless gum was invented as a caloric test of Allied solidarity. As you might expect, there are a whole slew of treasures to be found at the National Archives. If you want to explore them, just go to their "Wiki" page and enter First World War in the search box. 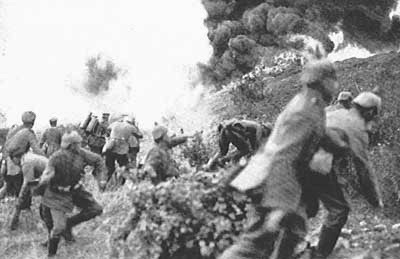 World War I is often depicted as a tragic accident in which the assassination of an Austrian Archduke by Serbian nationalists sets in motion a string of falling dominos that brings the old European civilization crashing down. The War That Ended Peace shows that there was much more to it than that. This book lays out the backdrop against which the actors played their roles. The Europe of 1900 displayed its splendors to the world at the Paris Universal Exposition as nations united by the ties of royal consanguinity and locked in colonial and economic competition outdid each other in presenting their civilization's march of progress that could never retreat. This civilization that was the master of the world lived in the shadow of the Franco-Prussian War and the challenge of a rising United States. MacMillan then examines the circumstances of the major countries that would guide Europe through the days that lay ahead. Britain, where the reign of Victoria, whose grandchildren would send armies to their deaths, was giving way to that of Edward VII, still ruled the waves but had a military largely committed to the preservation of its empire. Germany was a new country whose childish Kaiser Wilhelm II, grandson of Victoria, imposed his own will of taking his place in the sun by expanding Germany's army, the development of a navy to challenge Britain's, and his own brand of international intrigue. France was a still proud power licking the wounds inflicted by Prussia even while its leaders privately recognized the need to move on. 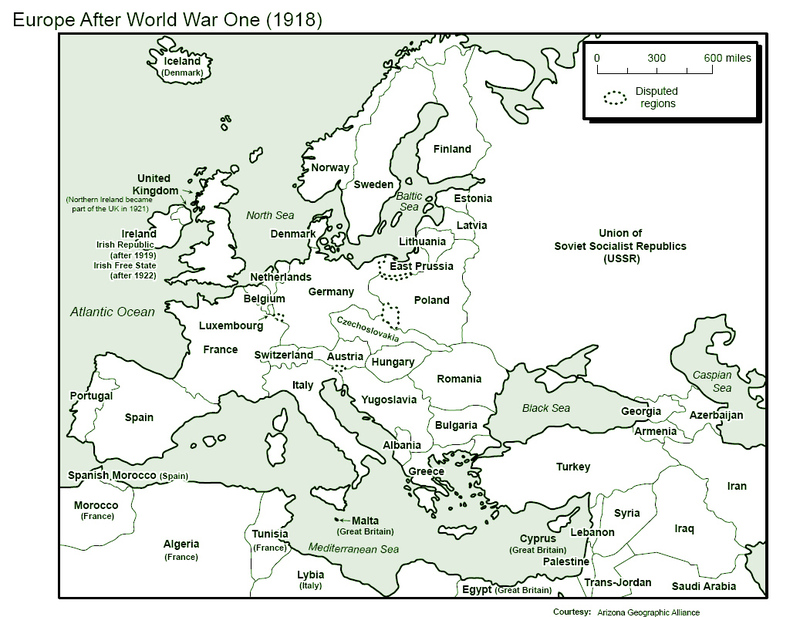 There were also the sick nations of Europe: Russia, a backward power developing with French loans and rebuilding from its defeat by Japan in 1904-05; Austria-Hungary an empire assembled by royal marriages but divided among Austrians, Hungarians, and minority nationalities as well as between the conservative and aging Emperor Franz-Joseph and his more liberal heir presumptive, Franz Ferdinand; finally, the sickest of all, the Ottoman Empire whose anticipated demise threatened to set the powers scrambling to pick up its pieces. In each of these nations monarchs, soldiers and statesmen assessed their alliances, the balance of power, both now and in the future, and decided when to fight and when to make peace. Just as Fort Sumter was not necessarily where the Civil War would begin, the assassination of Franz Ferdinand was not the heaven-ordained powder keg that would set Europe ablaze — Bismarck's prediction that "One day the great European War will come out of some damned foolish thing in the Balkans" notwithstanding. There were other potential sparks but the Concert of Europe, which had kept the peace since the Napoleonic Wars, was able to contain colonial ambitions, the Franco-German rivalry in Morocco, and a series of wars in the Balkans. By 1914 something had changed. Austria-Hungary felt that it must punish the Serbians in order to remain a great power. Germany, surrounded by France and a rising Russia, saw its relative position declining in the future so, if war was to come, the sooner the better. Russian and other leaders fearing socialist and other radical revolution found in war a foreign threat against which its people could rally. France foresaw its population imbalance with Germany worsening. To too many this was the time for a war that would, due to economic necessity, be short and relatively painless. Despite these forces peace attempts were made by some, including the Kaiser. Mobilizations were debated but ultimately were ordered. By the end of the book the lamps were going out all over Europe. The actual story of the war is for other works and, perhaps, other authors. The War That Ended Peace is the story of the misjudgments, the false assumptions, the called bluffs, the unalterable plans, and the flawed characters that combined to extinguish the Lamps for a generation and cast a shadow over Western civilization to this day. The story is momentous. The writing is superb. Margaret MacMillan has crafted a book that never taxes the reader's interest nor lets the mind wander. She asks questions such as whether the German naval buildup, which had little effect once war started, deprived the army of the resources that might have made victory over France possible? One technique that she uses to great advantage is to draw parallels between the events and conditions of a century ago and those of current and recent times. We are left wondering "Was this war necessary? "; "Why could the Concert of Europe not keep the peace one more time? "; and, most frightening, "Could WE do it again?" 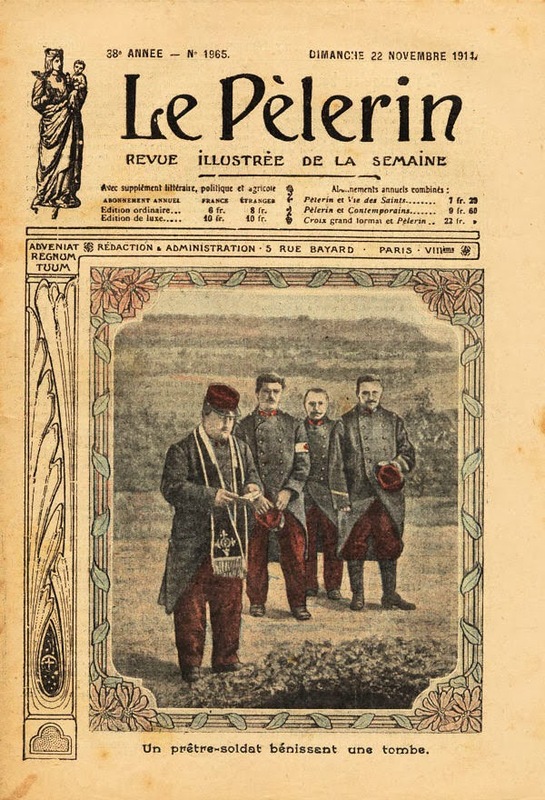 Le Pèlerin was a French weekly journal founded 1873 by the Roman Catholic Assumptionist order of priests. Naturally, during the Great War it covered its events extensively. Most of the work covered the troops and the fighting, but they also wanted to show the Church's support of the war and published a number of images and articles about priests (who were not exempted from serving and fighting) participating in the war. 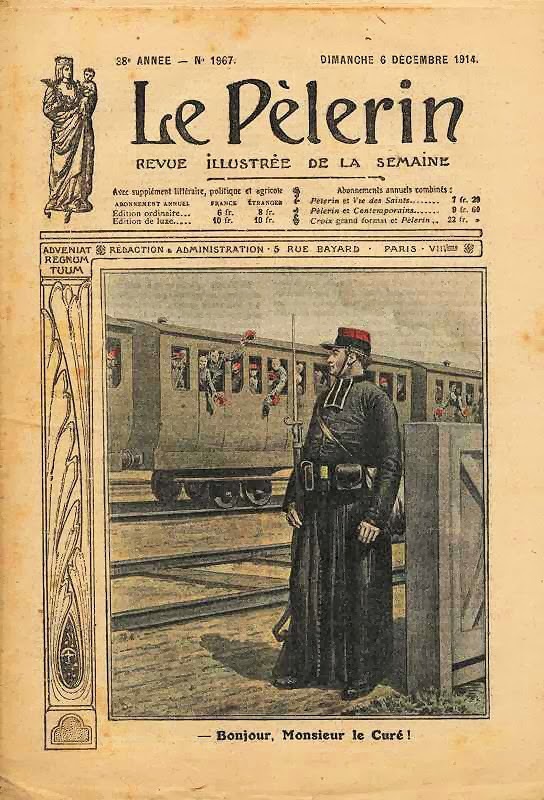 Le Pèlerin was published by the Catholic press and as such was chronically underfunded. That meant a lot of amateur contributions, volunteer work, and underpaid professionals to do work the less technically adept could not perform. And it also meant pushing parishioners and Catholic schools to buy the magazine. 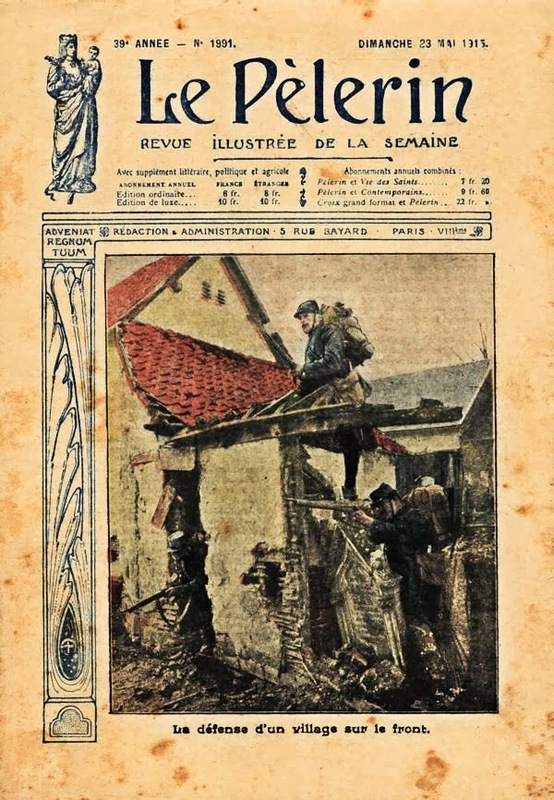 Publications like Le Pèlerin were printed in the cheapest manner possible using a cheap off-set procedure with large rasters, almost like in newspaper printing. They used photographs as covers and then hand-colored them to give a semblance of quality. The quality of this colorizing varied greatly. In France, and to a large degree in Belgium, priests were not given religious deferments in order to avoid military service. They were called up in the same manner (in peacetime) as other civilians and had no special status as such. If they were a student at a university or other institution recognized by the state, they would be given student deferments (before the war), but afterward were drafted all the same. They received no special deferments or treatments as such. Nor were there military chaplains before the war. In fact, when priests or candidate priests were called to service, they had a high chance of being the recipient of many a degrading task and were more than likely to be made fun of, have their noses rubbed in the crude and coarse way that soldiers lived in barracks or amused themselves when at liberty. Their comrades would be sure to teach them all the crude facts of life and pleasure when in some remote and dreary garrison town. This was often to a degree somewhat beyond the usual hazing inductees have to go through, as many French were vehemently secular and anti-religious in their outlook. During the war, however, due to the general feelings of national solidarity in adversity and the unity displayed by the Union Sacrée, the wartime coalition government of secularists and Catholics, less animosity was displayed by army authorities to priests in service. They were often given duties as stretcher bearers for instance and would act as unofficial chaplains of sorts. And the higher church authorities also cultivated their patriotic image. This worked fairly well, as the French could portray themselves as a Catholic nation, compared to the overwhelmingly Protestant make-up of Germany. Bavarians, though, were mainly Catholics, which is why there was often less animosity between the two in general. 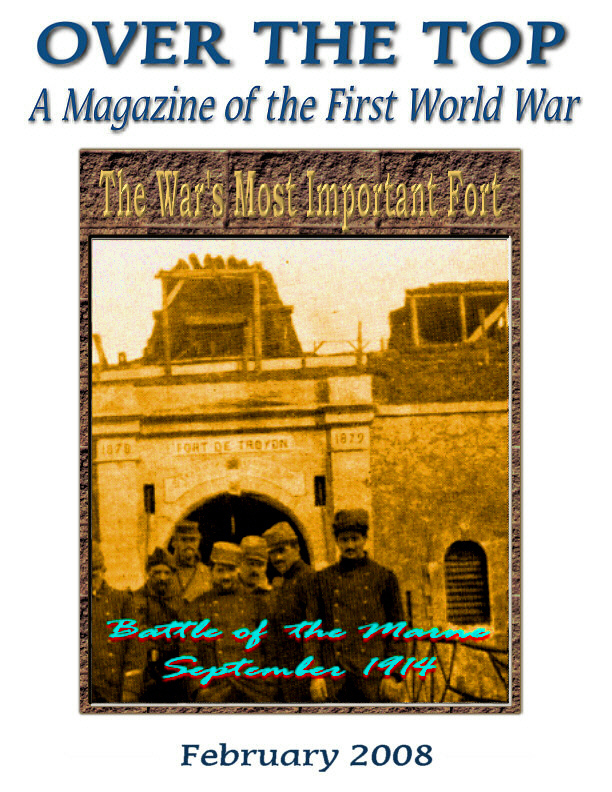 Roads to the Great War is part of the Worldwar1.com (link) family of websites and periodicals. It is produced by an editorial team, growing for over a decade, that includes: Michael Hanlon, Kimball Worcester, David Beer, Tony Langley, Donna Wagner, and Diane Rooney. 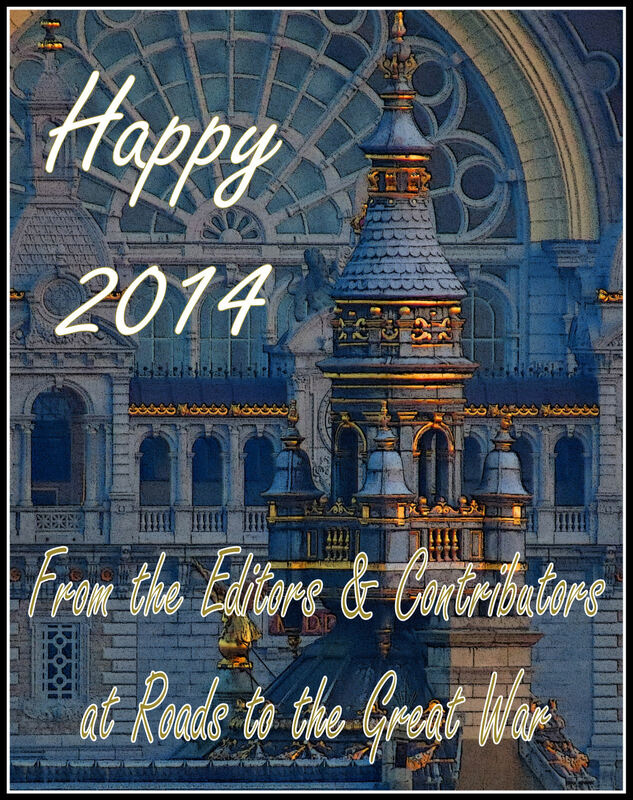 We will also be inviting other WWI historians, enthusiasts, and collectors to contribute to Roads.